Navigating a Missed Miscarriage — K L E P A C & C O . This is the photo I almost posted to announce our pregnancy last fall, but decided against it because it is so raw and requires some explaining that I wasn't ready to do yet. This was taken back in June after our first prenatal appointment in the parking garage of the doctors office. Obviously we were excited that we were pregnant. But we were also so relieved. After suffering a loss back in 2015 and then not having a positive pregnancy test for over a year after that. This is what pure joy and relief looks like. This is what it looks like when a huge weight of sadness and uncertainty has been lifted off of your shoulders. With all of the strength I could muster, I hit publish on this instagram post last September. Why was I so nervous to share our story? A story that isn't original. It actually happens to 1 out of 4 women in the United States. A story I am finally ready to share with the world. Back in the summer of 2015 we had just got back from our trip to Alaska when I had my period. No big deal we weren't trying to get pregnant or anything, but we were also not "not trying". 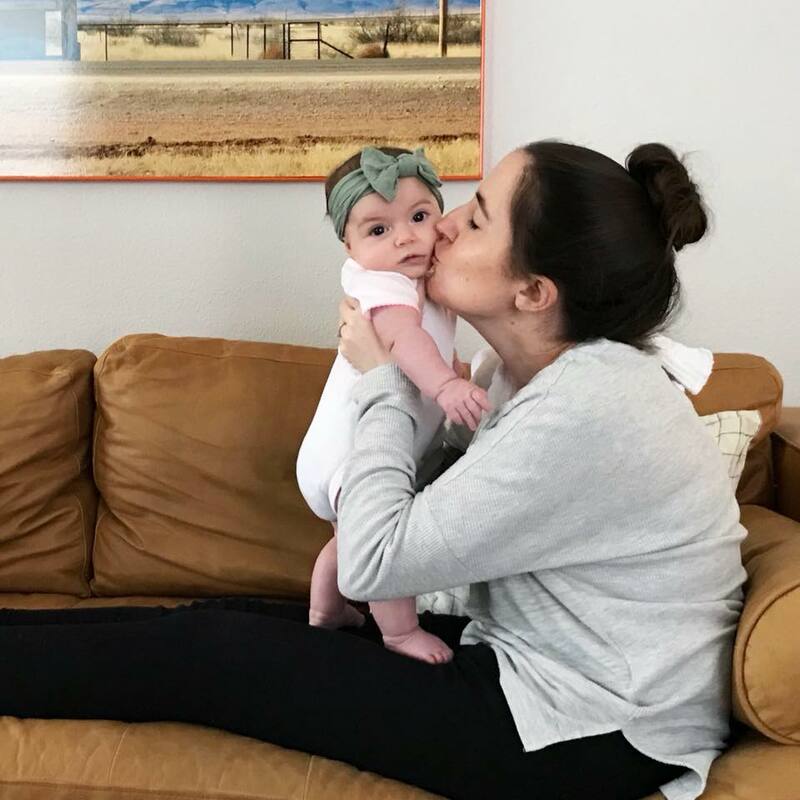 I had taken myself off of birth control that April and knowing it can take a while for that to get out of your system, we weren't really putting a lot of hope into anything yet. A week later I had another period. That's weird. I'm typically a very clockwork kind of person when it comes to my monthly visit. So needless to say I started the deep deep dive into googling. Most of the information I found said that I could be pregnant (!!) and that the second period could actually be implantation bleeding (all words I had never heard before, but now are so so normal to me lol). So I picked up a test on my way home from work and sure enough I was pregnant! It was right before Father's Day so I bought Derek a Fitbit with a card that said something along the lines of "you'll need to count your steps now that you'll be chasing after a little one" or something to that affect. Cute right? We were both SO excited and also SO nervous that we wouldn't be good enough or ready enough for this little baby. The next day I called my doctor to setup our first prenatal appointment. And thats when I realized this wasn't a normal pregnancy. "What was the date of your last period?" Well technically it was this date, but then I had another one on this date. "Oh." (after a long pause). That "oh" was not very comforting. So she scheduled it for the earlier date just to go ahead and do an ultrasound and see what's going on. Then we would have a better understanding of the time frame, and how far along this little bean was. Waiting for that first appointment was the longest 8 weeks of my life. Everything seemed totally fine though. I was eating all of the right things and not eating the laundry list of things pregnant women can't eat. I was famished all the time, I was super tired, and already feeling bloated. When the day of our appointment finally arrived we were so excited to see our baby on the ultrasound. They said it would probably be too early to hear the heartbeat, but that we would try anyway. So fun fact for those of you who don't know. When you see women get their first ultrasound on TV and they put the cold jelly on their bellies, that's not what happens at all. First of all, you don't get the over the tummy ultrasound until like 20 weeks. Not 8. So they have to do it vaginally, which let me tell you is oh so comfortable. It's kind of like a joystick all up in your business. My doctor had the screen toward her so that she could look at all of the boring things before showing us the little bean. I could see the look of concern in her eyes. She searched and searched, but she couldn't find the baby. She could see the fetal sack, but there wasn't a fetal pole. It was just empty. She explained that it could just be too early and that we may have been guessing off of the wrong date, and that there would be more to see in a couple of weeks. Either way we were crushed. Derek kept reassuring me that it was going to be okay and it may just be too early, and I agreed. Because I felt very pregnant. At least my short knowledge of what being pregnant felt like. They took some blood to check my progesterone levels, and wanted me to come back the next day to check my levels again to see if they doubled, which would mean that the baby was growing at the rate it should be, and maybe it was just hiding. I went back to work at that afternoon, and right before lunch I received a call with my lab results. Normal progesterone levels range from 11-90 during the first trimester and double everyday. The woman on the phone was calling to tell me that I didn't need to come back the next day to be tested because my progesterone levels were only a 3 and that even if they doubled it was still well under the appropriate levels they wanted to see. She explained that I had a Blighted Ovum and that I would soon miscarry. My head was spinning. I remember being in a conference room where I took the call and then immediately had to go into a lunch meeting where I just sat there running a zillion scenarios in my head while trying not to cry. No one around me even knew what was going on. No one even knew I was pregnant. Only Derek and my doctor. That night I told Derek and we both just cried. What an odd feeling to know you are going to have a miscarriage, but that it hasn't happened yet and you feel totally fine. Obviously I started googling the odds of a misdiagnosed Blighted Ovum and Blighted Ovums that turned into living breathing babies. There were several cases all over the world, so I clung to that hope like a big dummy. I read horror stories about how doctors told these women that they had an empty fetal sack and encouraged them to get a D&C, and so they found a second opinion and now they have a 3 year old. Things like that. Or even worse, the woman who did get the D&C but is now on the message boards saying how she'll always wonder if her doctor was wrong. Needless to say I got off the internet because it was a slippery slope into false hope. Weeks went by and I still hadn't miscarried yet. My doctor had me coming in 1-2 times a week to check my progress and ensure that the sack was still empty. It was. I finally started spotting and bleeding on and off for a couple of days, and my doctor explained that it could take up to a week for my body to evacuate this pregnancy, and that I would know when it happens. A week went by and I was still barely bleeding. She said that if I wanted to push things along that she could give me Misoprostol that would make it happen much faster so that I could get it over with and start to heal emotionally. It was a Friday, and she said that if it didn't finish that night that she would meet me at her office on Saturday and give me the medicine that way I could have the weekend to recover. So I agreed. She explained that it would happen very fast and be very painful, so she also gave me some pain killers. I didn't really know what to expect, since when you see it on TV it's just some blood and that's it. She explained that if I bleed enough to fill a pad in less than an hour to call 911 and go to an ER. I was officially terrified. She said that honestly this way is better if your body isn't doing it on it's own because it could happen while you are at work or in the car, rather than comfortable in your own home. I met her on Saturday morning to get the medication. That afternoon I felt some heavy cramping, but decided not to take the painkillers. I wanted to feel everything. Somehow I thought it would give me a sense of closure. If I was meant to go through this experience, then I wanted to experience it. I was also just curious to see if I could handle the pain. So. You don't just lose blood. It's not like a heavy period. Now that I've experienced childbirth, it's basically like the afterbirth you deal with for 4 weeks all piled into one day. It was extremely traumatizing to see and experience. For those of you who haven't experienced afterbith, it's basically like your body is evacuating globs of tissue that look like giant red egg yolks. I basically just stayed in the bathroom until it was over. Crying and having a panic attack. That next Monday I went back in to see my doctor to do another ultrasound to make sure that the pregnancy was completely evacuated. It wasn't. There was still a ton of tissue everywhere. After what I experienced, how was this possible? My doctor labeled this as a "missed miscarriage" where your body starts to evacuate the pregnancy but something happens and it can't do it on it's own naturally. She said I could wait it out and see if it would happen on its own, but that my experience Saturday could happen while I'm at work in the middle of a meeting, and could happen on several different occasions. And honestly after going through what I had already gone through I couldn't imagine there being more days of that. Or having to go through it in a public bathroom. Ugh. She suggested a D&C (Dilation & Curettage) where I would be put under a local anesthetic, and she would go in and scrape out any remaining tissue and basically hit a reset button on my uterus. Because even if I let my body do it naturally over time, there could still be residual tissue which would keep my body thinking I'm pregnant and would prevent future pregnancies, while also causing long-term side effects to my fertility health. I was terrified of this procedure (thanks internet) and the complications, but she assured me that as long as I don't have more than 5 there really isn't any harm to my chances of conceiving in the future. She explained that it was less than a 30 minute procedure and that I would be out of work for two days to recover. I had been spending the entire month planning a surprise party for Derek's 30th birthday where we were going to announce our pregnancy to our family and friends. Although that wouldn't be happening, I was still using the party as a nice distraction to have something exciting to look forward to in lieu of our current situation. The party was planned to take place that weekend, so my doctor moved her schedule around so that I could have the procedure and be recovered in time for his party. The morning of my procedure I was basically in a little triage bay all hooked up to my IV and filling out paperwork. At the top of my forms in big letters it said "Missed Abortion", to which my nurse said "I'm so sorry for your loss". I can still see her face. I immediately started crying. Why was it called that? The actual procedure didn't hurt at all, and my doctor confirmed that she was able to remove all of the tissue and that I would be ready to start trying again after a normal cycle, which could take up to three cycles until things were "normal" again. It took a while before we started trying again. We were both so scared to go through this experience all over again, and we wanted to be emotionally ready. Little did we know that it would take us 19 months to get pregnant. Our journey through infertility is a whole post in itself for another day. Throughout this process I learned a lot about who my real friends were, and I actually gained some really great friends along the way. Some of my best friends completely shut me out of their lives. I'm not sure if they just didn't know how to talk to me after finding out, but it's like I was invisible. Even our families didn't know what to say. Some would check in every now and then to see how we were doing, while others just pretended like it never happened and would openly say things like "I don't get why people have such a hard time getting pregnant, we got pregnant right away. A+B=C" And other insensitive things. On the flip side, after finding out that I was out from work for two days for a medical procedure, one of my coworkers asked me how I was doing and alluded to the fact that she knew what was going on. It turned out she had gone through a very similar situation and so we bonded over that. We now both have healthy happy babies and have come out on the other side of this all. If you have suffered a miscarriage and are feeling alone or less than, please know that you are not alone. If nothing else, I am here to listen. It's okay to be upset, to be pissed, to feel sorry for yourself, to feel inadequate, to feel hopeless. But know that you are none of these things. These are just emotions that will make you stronger in the end. It will make you appreciate your children whether biological or adopted or fur-children. It will make you love with a vengeance. You survived this and you are powerful. Welcome to this very special club that no one wants to be in.